We traveled to Montana last week to see cowboys, cowgirls, cows and more cows. Having spent most of our time in Missoula and Bozeman, I can only speak to the food of those places, but, in a word, it was excellent. Well, most of it anyway. A&W is little known where I’m from. My mother once spoke of old time Stewart’s Root Beer hot dog stands on the sides of vacant roads, but I hadn’t encountered one until I went to Vermont. In 2012, A&W, another root beer titan, no longer has random hot dog stands, instead it has made its mark in the 21st century as a fast food restaurant adjacent to KFC. I was hesitant at first, but ultimately gave in to the promise of a cold root beer in a frosted mug. My Dining Partner (MDP) ordered the Big Papa burger, which featured lettuce, tomato, cheese and some kind of sauce, unlike the very basic cheeseburger that I ordered. Though the cheese wasn’t melted on Big Papa, it sure did hit the spot. And the root beer was spectacular. Nestled in the heart of downtown Missoula is biga pizza, a brick oven pizzeria that serves up some of the best pizza I’ve ever had. Anywhere. Including New York City. We ordered the Panzanella salad to start and the Sicilian pizza, which comes with sausage and roasted red peppers on top. Though they may not use the legendary water of New York, biga pizza’s crust was fantastic–cooked perfectly, crisp on the edges and lightly brown on the bottom. The key to biga pizza is the mascarpone, I’m convinced. 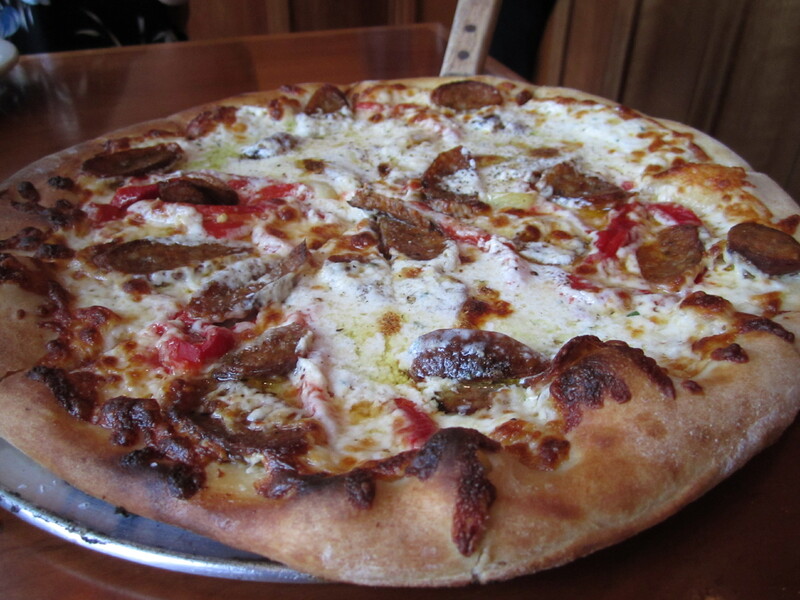 Most pizzerias don’t opt for the expensive dairy product, but they well should. It truly makes the difference in the pie’s texture and taste. If you’re in Missoula, you must endure the wait at biga pizza just to sample the pie. Missoula is a city of bridges and good coffee. 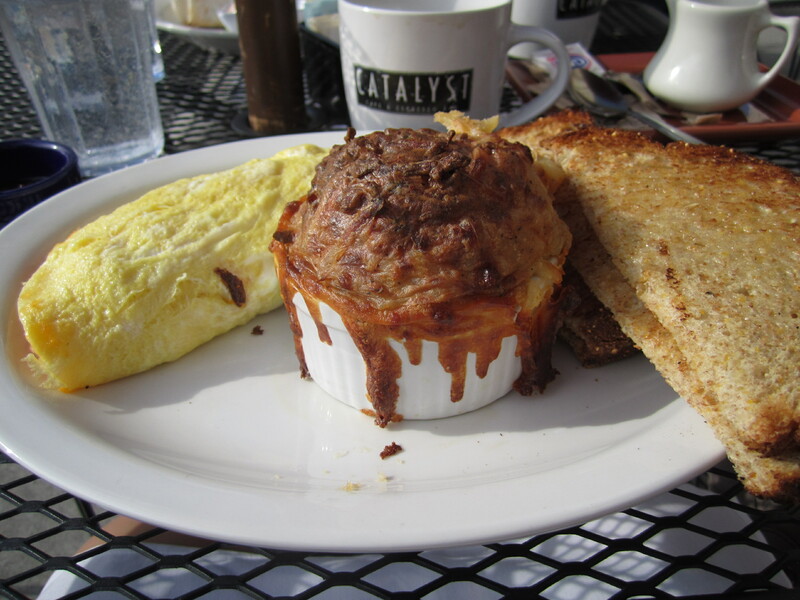 Having lived in Missoula, I knew all the best places to get the best coffee and breakfast. The Catalyst was at the top of my list of places to go. MDP ordered a breakfast burrito, which he greatly favored, and I ordered the three egg omelet with chopped red pepper, onion and cheddar. My egg dish was accompanied by a delightful potato casserole and–best of all–Birdman bread toasted. Now, Birdman bread is probably my favorite sliced bread out there. It has many seeds and tastes great toasted. I was in heaven. Now, a trip to Missoula wouldn’t be complete without stopping at Hoagieville. After we went to the National Bison Range, we were mighty hungry and in need of nourishment ASAP. So, we went to Hoagieville for a grilled chicken sandwich and a fishwich (MDP likes to order fish at fast food places … weird, I know), and, above all else, cheese fries. 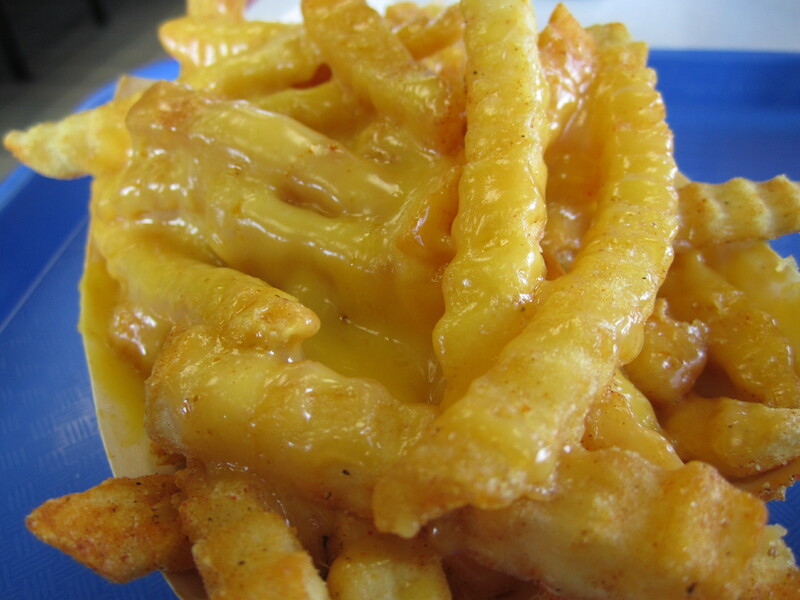 The cheese fries are seasoned and glued to their little container with mounds of melted cheese. Better than ketchup, ranch is the condiment of choice with these fries. 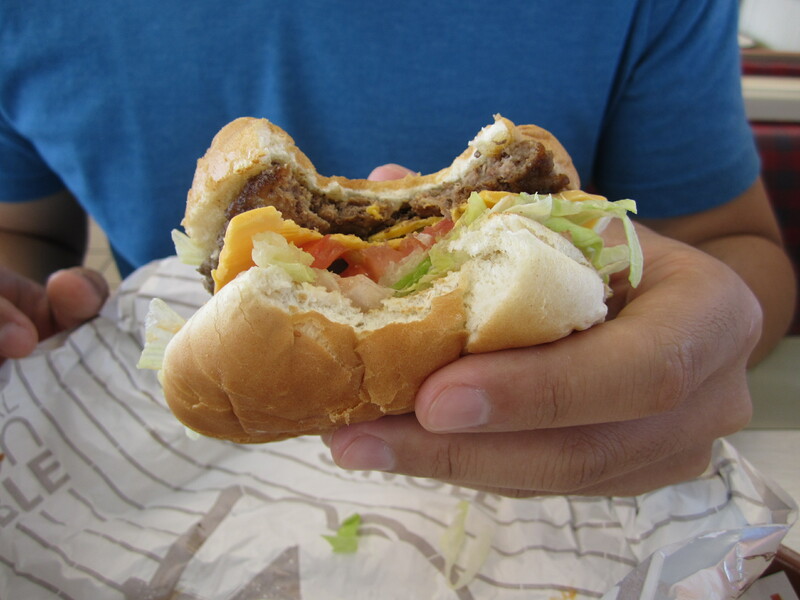 You can’t go wrong with ranch in Montana. Two of my favorite bakeries in the world are within two blocks from each other: Bernice’s and Le Petit Outre. Both offer stellar coffee (see? It’s a thing in Missoula) and amazing baked goods. 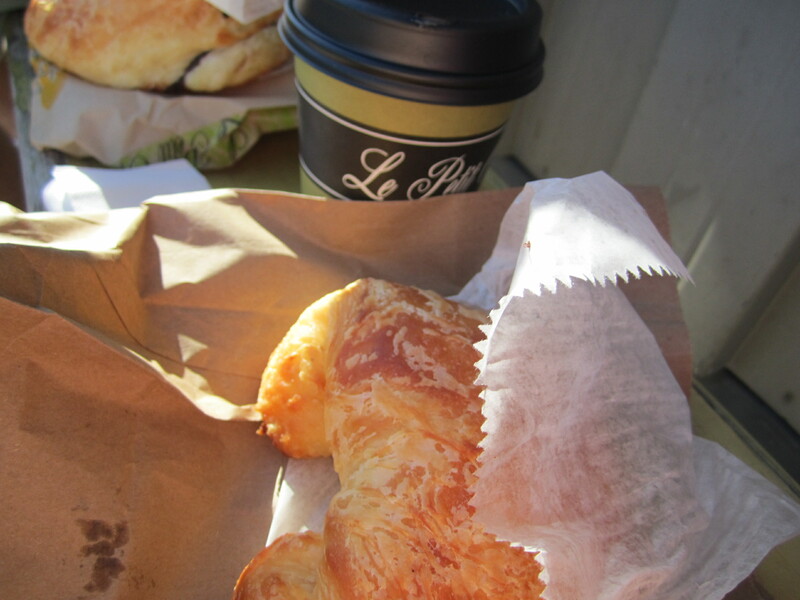 On this particular morning, MDP and I sampled croissants from Bernice’s and a vanilla bean scone from Le Petit, with incredible mochas to wash down the goodness. The croissants feature delectable fillings, such as herbs or chocolate, which MDP ordered and seemed to enjoy. The croissants themselves are fluffy and flaky, and substantial to bite into. 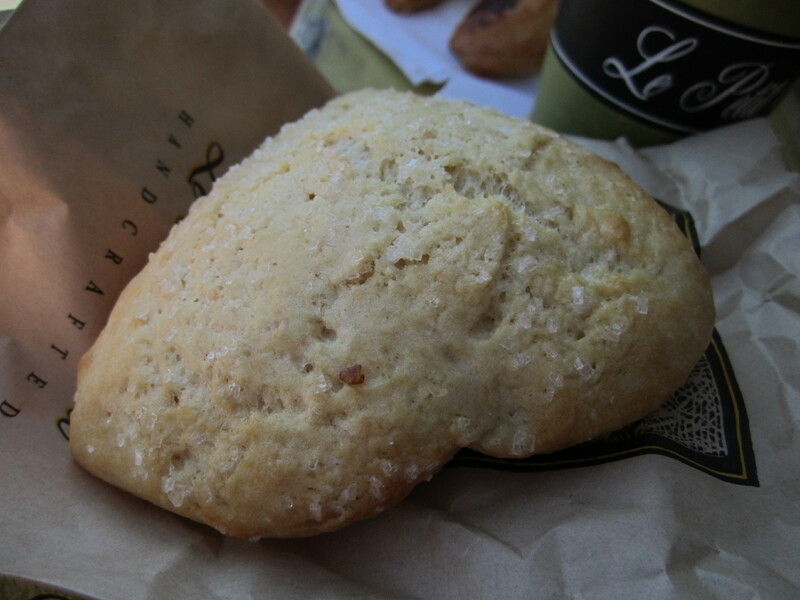 At Le Petit, you’re safe with any of their baked goods, but my especially favorite one is the vanilla bean scone–a not-too-sweet baked treat with crystallized sugar on top. And don’t even get me started on the coffee! Le Petit hits it out of the park with their mochas. Believe me, you gotta try one. After all that good food in Missoula, we came to Bozeman and were just kind of “eh” about the food (until we got to Blackbird Kitchen, which I’ll get to later). 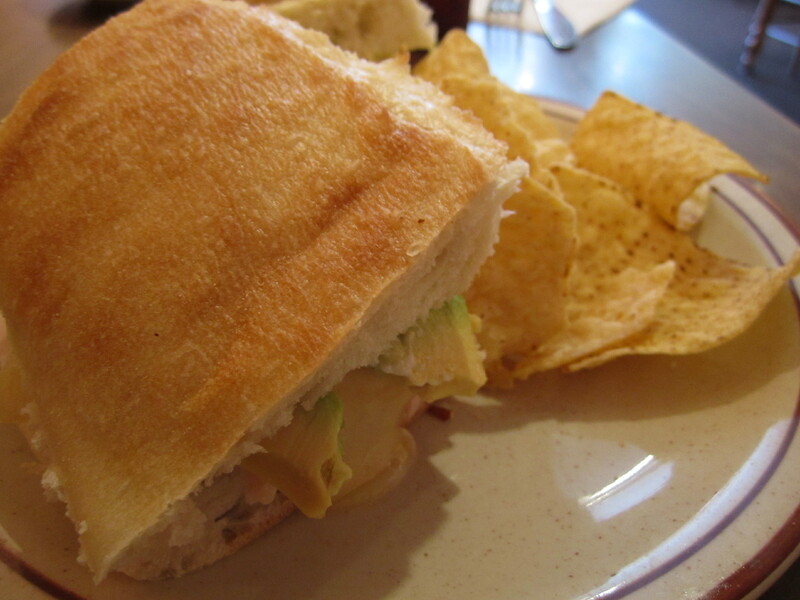 The Garage kicked off a string of subpar meals with their kind-of-expensive-for-Montana lunch. 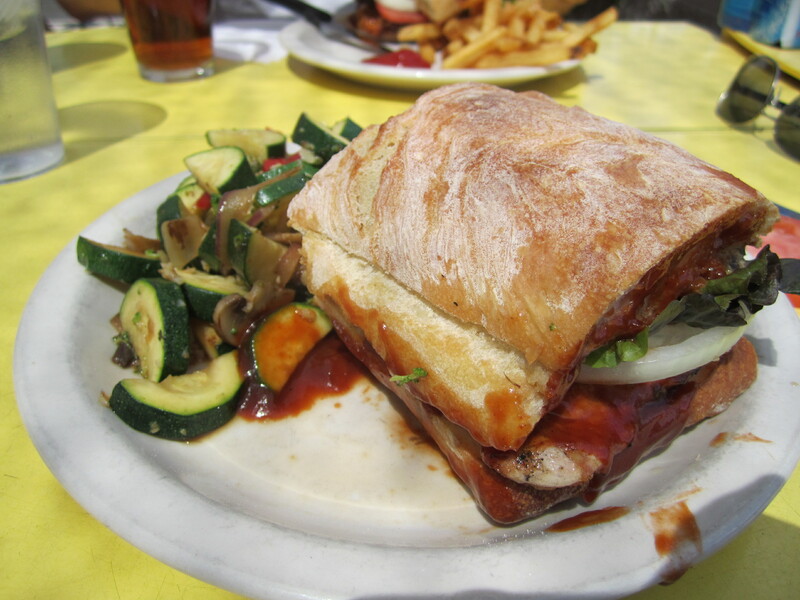 MDP ordered the pulled pork and I got the barbecue chicken sandwich with sauteed vegetables (aka zucchini). They were both just okay. We had to wait about 15 minutes for our table, which seemed odd since we were 1.) in Montana and 2.) it was lunch time. It wasn’t worth the wait, so don’t bother–there’s plenty of places to eat on Main Street. 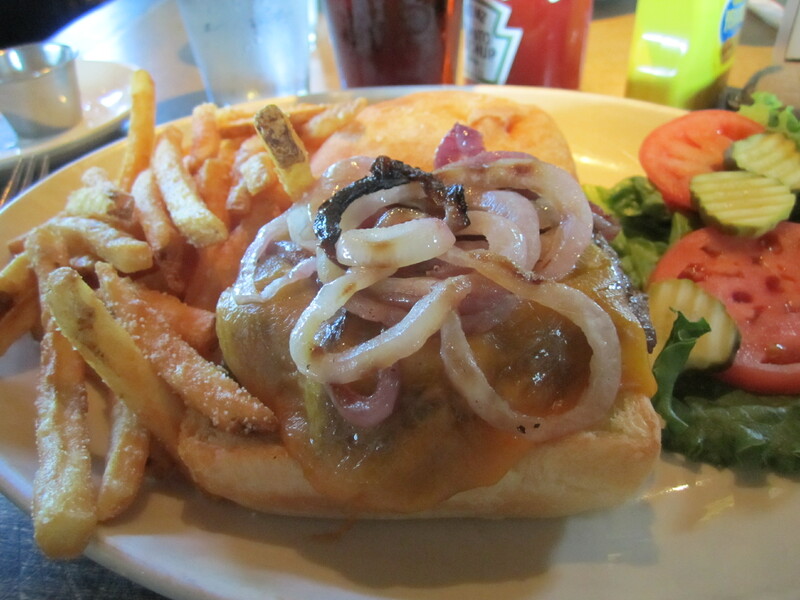 Since we were in Montana, I had to order the bison burger from the popular Montana Ale Works restaurant on Main. MDP ordered a regular burger, which he liked, but I wasn’t entirely impressed by my bison burger. It was somewhat flavorless and tasted tough. This may have been a combination of the meat and the way they cooked it. Who knows. For dessert, we ordered off the ample dessert tray that was passed around the restaurant; we fancied a white chocolate mousse cake with strawberry topping, which was quite good, although the cake wasn’t as flavorful as the sauce was. I wouldn’t bother with Montana Ale Works. As MDP said, “I’m tired of eating at Applebee’s everywhere we go.” I think he was, in part, referring to The Garage and Montana Ale Works with that statement, so. The only thing that was redeeming about Montana Ale Works was the service. Our waiter was outstanding! Nova Cafe is a nice little spot on Main Street that only serves breakfast and lunch. They seem to do pretty well for themselves, despite their limited menu. MDP ordered the early bird special, which came with a half waffle, eggs, bacon and delicious, local toast. 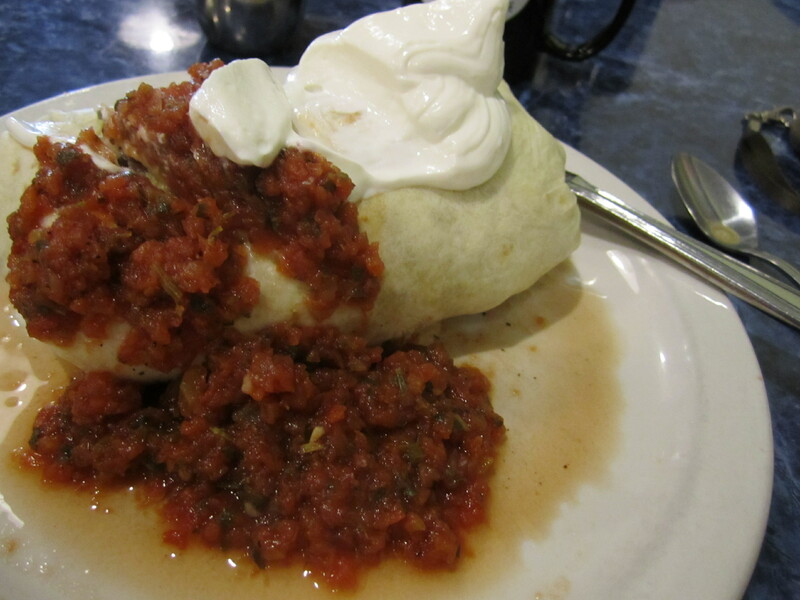 I got the breakfast burrito with avocado mixed in–very good, but not nearly as good as my omelette at The Catalyst. I’d recommend Nova, as it may be one of the only decent restaurants in Bozeman (other than Blackbird Kitchen!). So we spent one day in Yellowstone, which was rather nice. You can see more pictures of our trip here. We had to eat something, so we decided to stop in at the Roosevelt Lodge up by Tower Fall in the park. We waited for a half hour for our table, which was expected given the hectic nature of the park and all the tourists who were afoot. 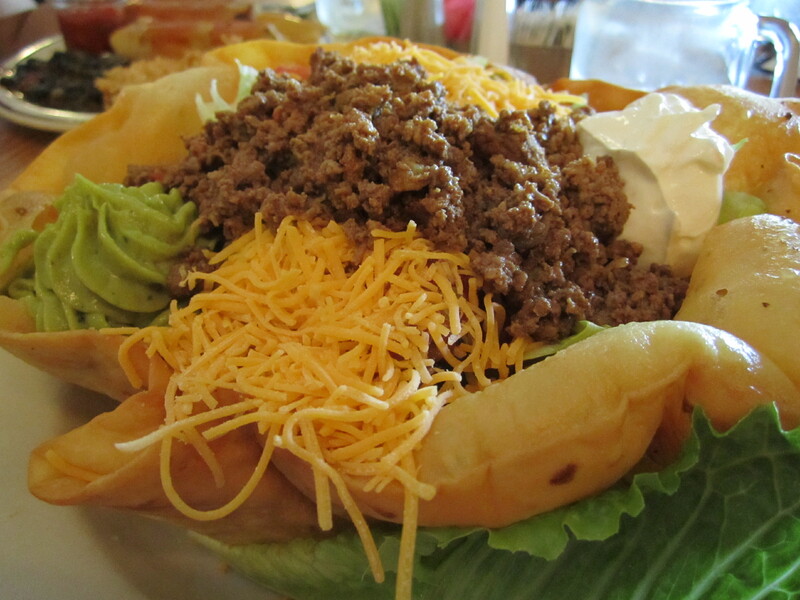 I ordered the taco grande salad with wild game meat (meaning elk and bison–very tasty!) and MDP ordered the bison tamales. Neither of us were terribly impressed with the food, but we ate it anyway since we didn’t have very many options. You want good Italian food? You go to New York City, right? Think again. GREAT Italian food is lurking in Bozeman, Montana. Blackbird Kitchen, a relatively new establishment to Main Street, rocked my socks. It was local, fresh and delicious. From soup to nuts, we were impressed. For an appetizer, we ordered the burrata, which came with a delectable sliced peach bathed in a balsamic reduction over lettuce, with two pieces of crusty Italian bread. It was truly spectacular. 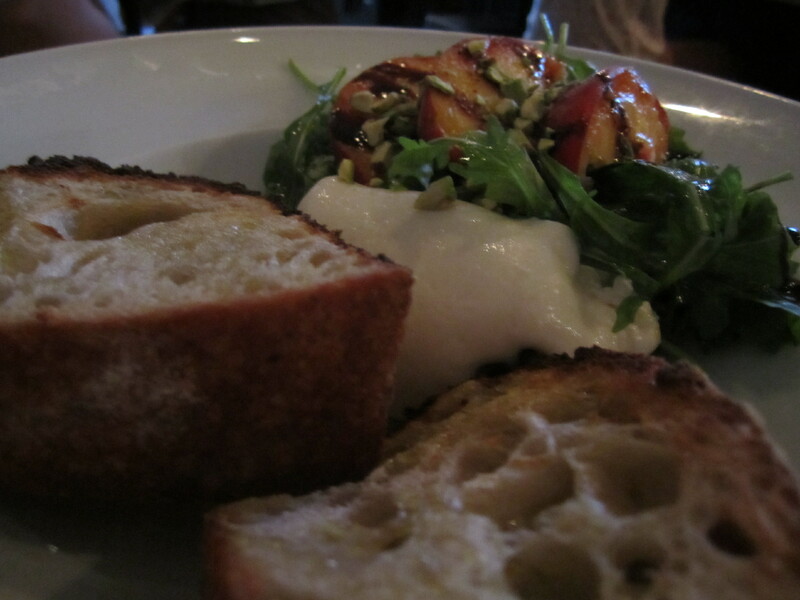 The burrata was so soft and creamy, and the bread’s texture was a perfect complement to the cheese. I was in heaven. For entrees, I got the tagliatelle, which came with a sage sauce with spinach and was to die for! MDP enjoyed his dish as well–pasta with a pesto sauce topped with goat feta. Wow, who knew this kind of food was even in Montana? And for dessert we ordered the chocolate bouchon with maple nut ice cream–incredible! Do go to Bozeman for Blackbird Kitchen. You won’t regret it! Right before we got on the plane, we drove over to Livingston, a quaint community with a reputation for art galleries. We went to Pinky’s Cafe for lunch. Rumor has it this restaurant was featured on one of Anthony Bourdain’s shows, so it must be good, we thought. It was okay, truthfully. I ordered the Pilgrim’s Progress sandwich, which had sliced turkey breast, Swiss cheese and avocado on a ciabatta bun that tasted more like a soft roll than ciabatta. MDP got the barbecue chicken sandwich on ciabatta with “Asian” cole slaw (aka cole slaw with soy sauce). His was okay, too. The best thing about Pinky’s was the bathroom which was pink hued and filled with flamingos. Who knew. After Pinky’s, we stopped at Dairy Queen for a Blizzard and Peanut Buster Parfait. Both were delicious. That was our trip in meals, in a nutshell. I hope you enjoyed reading this very long post! Thanks for the outstanding food report! I could do with some cheese fries (with ranch dip) from Hoagieville right now. Thanks for the outstanding food report! I could do with some cheese fries (and ranch dip) from Hoagieville RIGHT NOW.